Do you ever feel uncomfortable asking the flight attendant for a seat belt extender when you're on an airplane? Now bring your own! IMPORTANT: Please note, this Airplane Extender does NOT fit most Southwest Airlines airplanes. The Extender adds up to 24 inches and its color may vary. Information, products and services made available to you are provided on an entirely "as is" and "as available" basis, unless otherwise specified in writing. GreaTravel makes no representations or warranties of any kind, whether expressed or implied. GreaTravel disclaims all warranties, whether expressed or implied, including, but not limited to, implied warranties of merchantability and fitness for a particular purpose, title, compatibility, accuracy, security, or non-infringement. GreaTravel will not be liable for any damages of any kind arising from the use of this website or from any information, content, materials, products or services included on or otherwise made available to you through this website, including, but not limited to direct, indirect, punitive, incidental, and consequential damages, unless otherwise specified in writing. Airlines have the right to restrict or prohibit use. Not affiliated with, endorsed or recommended by any airline. CLICK 'N GO & ADJUSTABLE - Simply click in the seatbelt extender and adjust the belt to add between 7 to 24 inches of additional length to the existing seat belt system for a customized and comfortable fit - No further installation required! FREE CARRYING CASE & OWNER'S CARD INCLUDED - Never ask a flight attendant for an extender again! Easily rolled into a compact size, this discreet, portable airline belt extension can be kept in its carrying case in your carry-on! The card proves it's yours. GET IT QUICKLY - Got an upcoming flight? This item ships within one business day. Expedited shipping options like 2-day and overnight are available at check-out. Buy yours today! THE BRAND TO TRUST - Seat Belt Extender Pros is the world's leading brand for automotive safety belt extensions and related products, and you can trust them to deliver the highest quality safety and service available. 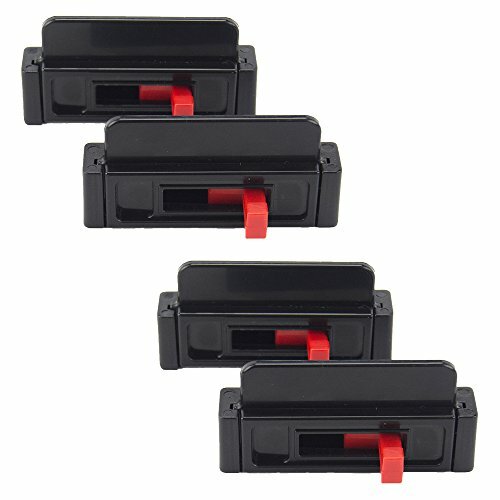 Brand: Seat Belt Extender Pros | Manufacturer: HY Auto Parts Co., Ltd.
Universal Fit For Most Cars, Trucks and SUVs: for 2012 BMW 128i, 2010 BMW 328i/ 335i/ 528i/ 535i/ 650i/ M3/ M5/ M6/ X3/ X5/ X6/Z4, etc. Note: It may not fits some cars, such as Toyotas or Subarus. Material: Real Carbon Fiber And Aluminum Alloy. Placement on Vehicle: Left, Right, Front, Rear. Seat buckle clip is a great combination of fashion and functions. CarNeed is the trademark of HeDou. Any other sellers who sells products as CarNeed is fake. Material High-quality Carbon Fiber And Aluminum Alloy. Specification Length: 2.4in; Width: 2in; The tongue Width 0.8in(20mm). Unique Carbon Fiber Blue Spun Buckle. Compatible Suitable for most Cars, Trucks and SUVs, may not be suitable for Japanese cars. Hula Hooping is the New Workout of 2018!Dance, Twist, Sing, Hula Hoop, & Have Fun Burning Those Calories At Your Next Workout! 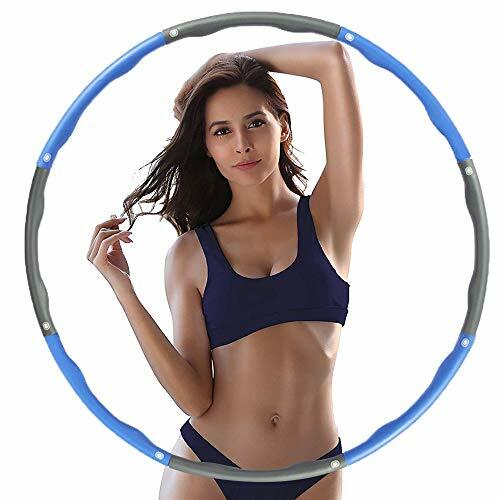 Hula Hooping is the Vintage Childhood Activity, Fitness Guru's Have Improvised & Tailored Your Favorite Childhood Activity Into Your New Favorite Workout Routine!! Brave Tarzan Only Uses The Finest Materials To Engineer & Create Your 3 Pound Adult Hula Hoop Made up of: 8 Adjustable Segments: Designed to be used with 6 segments, 7 segments, or 8 segments. Less Segments make the difficulty much harder! Premium Foam Padding: Protects & Massages Your Inner Organs Vibrant Colors: Green, Orange, & Silver 2.5 - 3 Pounds of Resistance: Customize the Perfect Amount of Resistance to Intensify Your Favorite Childhood Activity! Hula Hoop Cardio Training Is The Newest & Funnest Way To Workout! Improve Flexibility Increase Coordination Add Cardio to Any Workout Tone Your Inner Core & Waistline Enhance Cardiovascular Fitness Intensify Calorie Burning Practice Dancing Or Just Work Up A Sweat! Whatever Your Fitness Dream Is, Brave Tarzan' Weighted Hula Hoop Can Help You Reach it! Our portable & adjustable hula hoop breaks down into 8 pieces allowing you take it with you and store it everywhere you go! Stop Wasting Your Time With Boring Daily Workout Routines & Start Burning Calories A Better Way!Bring Your Weighted Hula Hoop, to your next: - Gym Session - Group Exercise Classes - Dancing Session - Camping Trip - After School Events & More! 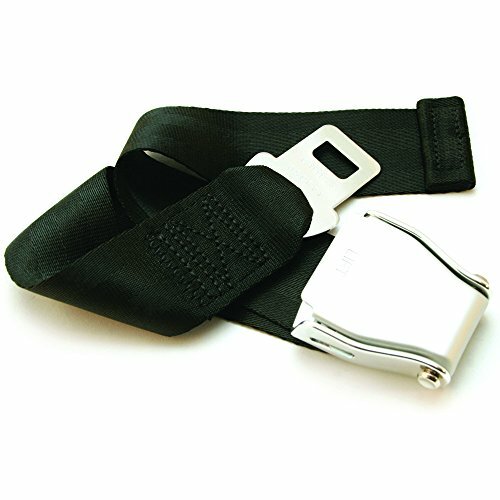 If the airline's seat belt is too short, the universal airplane seat belt extender can help! Clicks right in and can be adjusted in size to add as little as 7 or as many as 35 inch for safety and breathing comfort. The airplane seat belt length fits most airlines, including: Air France (KLM), AirTran Airways, Alaska Airlines, American Airlines, British Airways, Continental Airlines, Delta Airlines, Frontier Airlines, JetBlue, Lufthansa, SwissAir, Air Canada, United Airlines, U.S. Airways, Virgin Airlines, Singapore Airlines,and MORE! IMPORTANT: Please note, this Airplane Extender does NOT fit most Southwest Airlines airplanes. May not be compatible with first class seats. Got an upcoming flight? This product ships within one business day. Expedited shipping options like 2-day and overnight are available at check-out. Material: national standard polyester ribbon and chrome-plated steel,strict sewing,high expansibility. COMFORTABLE JOURNEY: Easily adjust the airplane seat belt extension, put your mind and body at ease. Save you many uncomfortable journeys. No longer need to ask a flight attendant for an extender! SAFETY:Our aircraft seat belt extender meets FAA & E4 safety standard. It complies with 2018 improved version made from national standard polyester ribbon and chrome-plated steel. PORTABLE:The plane seat belt extender is mini and easy to carry. You can simply fold up it and keep it in your pocket , luggage ,bag, etc. Discreetly use it without embarrassment. GREY COLOR: The airline approved seat belt extender is similar in color to most airplane seat belts, which are usually grey. It will not make the extender noticeable to flight attendants, who might give you a hard time about not using the airline's extender. WORTHY: Get your own now! Invest in your safety and comfort now and you will have a pleasant trip! We guarantee to offer the high quality products and best service. If any problems, you can contact us.We will provide you with satisfactory solutions. Material: High quality polyester fabric; Our Universal Lap Seat Belt is certificated by E11 - The highest safety level,which ensure your safety while using. 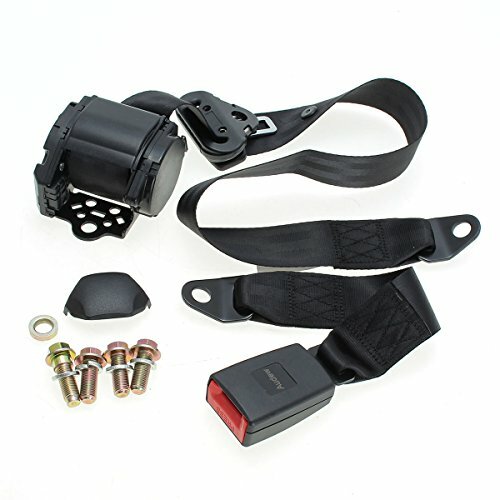 Package include: 2Pcs* heavy duty safety seat belt + 4Pcs* screws for installation. 1. Seat Belt Extender requires no installation: just Click-and-Go. 2. 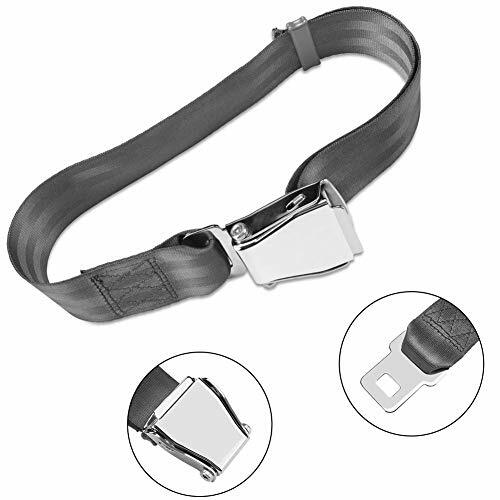 The car seat belt extender is made of high quality stainless steel and high-quality ABS. Strictly sewn, with high quality, high expand-ability, etc. 3. The metal tongue design makes it easy to install and remove the seat belt extender to ensure safety in emergency situations. 4. Different extension lengths are available to meet various needs. While providing comfort in cars, it also ensures driving safety. This product is suitable for people who cannot wear a belt because the belt is too short. Please refer to the dimensions and instructions clearly before purchasing because the product may not be compatible with your vehicle.Check the width of the metal tongue of the seat belt. It should be 7/8"
Security Assurance: Markers Knitting Stitc,all of our products pass E11 safety certified that in line with nation security regulations, and we also pay attention to every detail, in order to eliminate safety hidden trouble. Easy to use: Seatbelt extension line is E11 certification without installation, just insert for use. High Quality: Our seat belt buckle extender is a rigid belt with metal buckle tongue, high performance and super tensile strength. It can withstand 1.6 tons of tensile strength, is not easy to break, and is safer. Made of high quality material, it can be inserted repeatedly without fading or stationary. Not easy to break, safer. Applicable crowd: The expander is suitable for people who can not use heavy equipment in other ways, increase the size of existing seat belts, and increase comfort. These include children with seats, drivers with larger waists, pregnant women and people with mobility problems. 100% Quality Assurance: We hope our products will satisfy you. If there are quality problems, please contact customer service immediately. You have a refund guarantee. Farochy seat belt adjuster gives your car seatbelt with useful automobile safety. 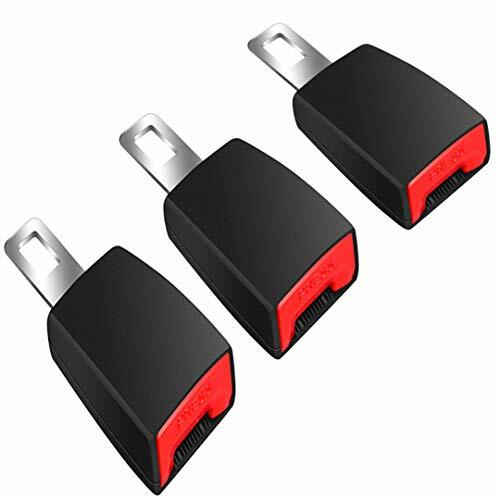 With using this car seat belt clips for more safety driving, you can avoid injury and enjoy your journey more! Don't hesitate and buy now! 1, Open the Seat Belt Clips, put the safety belt into proper position, cover it. 2, Fasten the seat belt, pull it and make it slightly loose. 3, Open the seatbelt clips and move them to the expansion opening. Close the buckle again to secure it. The Seat Belt Clip is fixed on the safety belt to reduce the tension of the belt. It won't influence the safety of seat belt. EXCELLENT MATERIAL - Farochy car seatbelt adjusters are made of top quality ABS plastic, which are strong, durable, wear-resistant and reliable. HUMANIZED DESIGN - There is a buckle design on the back of our seatbelt adjuster to control and fasten the tightness of the seat belt freely. EXTENSIVE SUITABLE - Farochy universal seat belt buckles designed to fit nearly all car seat belts (fits up to 53mm). Plus, our seat belt clips are easy to install and use. No welding, melting or glue and no tools are required. SAFETY ISSUES - With using seat belt strap clips, drivers and passengers can avoid neck injury when emergency braking. Plus, You and your family can adjust the seatbelt length at will and reduce the discomfort caused by the seatbelt. Enjoy and relax your trip! 100% MONEY BACK GUARANTEE - We offer a 100% money back guarantee in case of you are not happy with the product for any reason. We'll process full refund or send you a replacement without returning or any additional conditions. All issues will be solved within 24 hours. Do you struggle with finding seat belt receivers every time you get in the car with your toddler? Does your child find it difficult to fasten their seatbelt on their own? Do you have an elderly relative with strength deficiencies in their arms? Have you had enough of refereeing sibling seat belt wars in the back of the car? 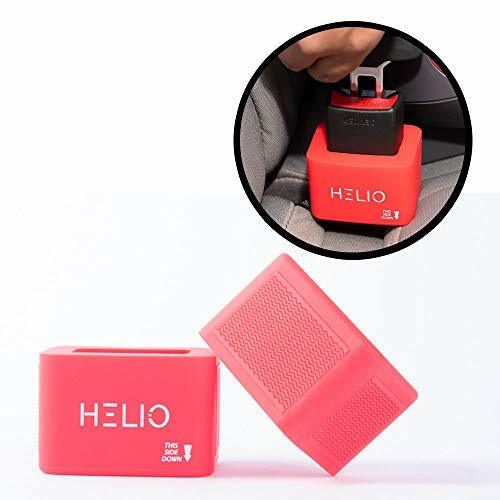 At Helio, we know how important safety and security is, whenever you travel any distance in your car. We also know that parents are looking for the ultimate in safety for their children at all times. After consulting with parents, care givers, those with arm strength deficiencies & travellers with mobility issues, we accessed the very latest in seat belt technology, and then designed the ultimate in seat belt safety, offering fast, easy buckling-up for everyone from toddlers to disabled travellers. Manufactured from premium grade silicone, our revolutionary new design featuring open slot technology is flexible yet durable, easily able to withstand the rigors of repeated use. This system is so discreet that you can fold your back seats down without obstruction. Your expensive car upholstery will remain intact due to the flexibility of silicone used in the manufacture of our seat belt holders. Our seat belt holders sit well away from the seatbelt buckle mechanism, seatbelt insertion slot & push release button, so there will be no interference to the operation of the seat belt at all. Simply slide the seatbelt buckle holder over the seatbelt receiver and keep pushing downwards until it sits on the car's back seat, and that's all you need to do! The seatbelt receiver will now sit in an upright position, ready to receive the seatbelt. IDEAL FOR SENIORS & PEOPLE WITH SPECIAL NEEDS: Our easy to use seat belt holders keep the seat belt holders in place and in an upright position, providing safety for seniors and people with specials needs or Arthritis pain to buckle up. Make life simpler not only for adults, but also for elders and caregivers. Our seat belt holders are so easy to use - you will wonder what you ever did without them! HIGH QUALITY DESIGN & FAST INSTALLATION: Crafted using the highest quality flexible silicone & offering extreme durability, once installed they remain in an upright position for easy access by all passengers. Unlike other plastic products on the market, our products will not tear or damage your leather or cloth carseat upholstery. UNIVERSAL DESIGN: Helio seat belt holders are designed to fit most car seat belt receivers but in some cars - it may not fit. Please check your backseat buckle design before purchasing to ensure our seat belt buckles will fit your vehicle. Our seat belt buckle holders are compatible with most major car manufacturers including Toyota, Honda, VW, Ford, Chrysler, Kia, Hyundai, GM, Chevy, BMW, Mercedes, Audi, Acura, Lexus, Infiniti and others. Buy one today! TOP NOTCH CUSTOMER SERVICE: We pride ourselves on our high-quality products and outstanding customer service. If you have any issues, please contact us and we will make it right...fast! 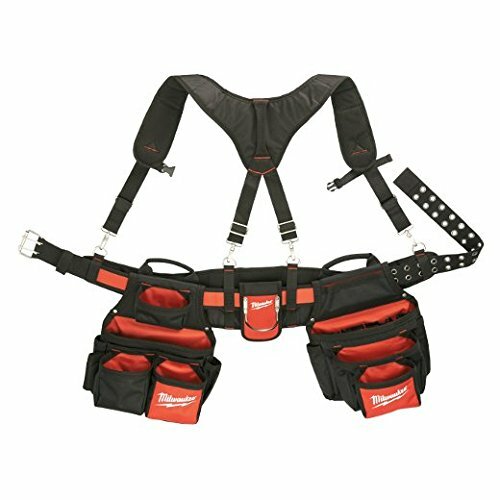 Contractor Work Belt W/ Suspension Rig. The Product is Easy to Use and Easy to Handle. The Product is Highly Durable. Made In China. Hook and loop fastener. 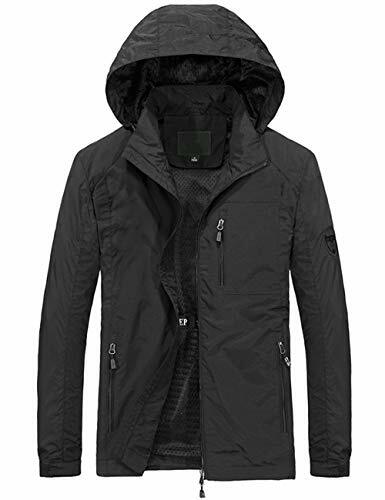 Neoprene and nylon material offers a better comfortable feel. Cover can be used to protect your shoulder and is very easy to install or remove. SOFT AND DURABLE:The seat belt cover is made of nylon,neoprene webbing over cotton. It can reduce the seat belt rubbing against our neck or shoulder. MATCHING YOUR RED INTERIOR: A combination of red and black can make your car look sporty and dynamic. UNIVERSAL SIZE: Dimensions: 21 x 16cm/ 8.3 x 6.3 (L*W). Our seat belt pad is designed to fit most type of seat belt, it can also be used for Backpack, Shoulder Bag, Laptop Bag, Camera Bag, Diaper Bag, etc. EASY TO USE: No extra tools required. Just wrap them around the seat belt strap, once you cinch your belt, then you can just slide it to the position that fits you the best. If you have any problem please contact us freely. Durable Material - Heavy duty Durable nylon fabric straps, 100% High strength polyester, high quality guarantee. It is a universal belt for UTV, Buggies, Club Golf Cart, Go Kart, Van, VR, Truck, Cars and Vehicles. 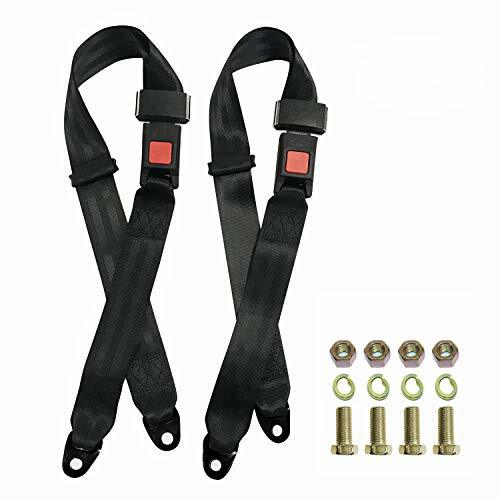 High Safety Factor - Audew 3 point Safety Harness Kit, Tensile strength, which provide added safety in driving, by being firmly secured in the seat, prevents the accidental or deliberate release of safety belt buckles, 100% security assurance. 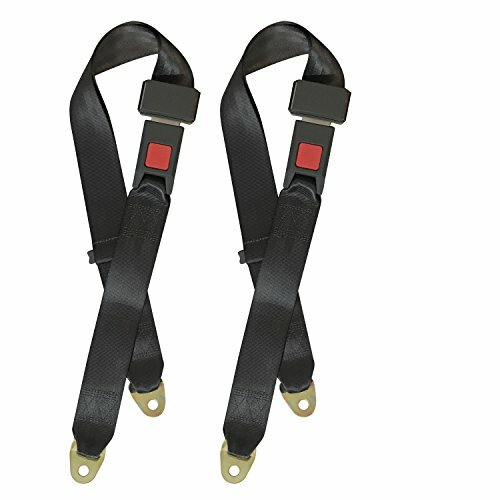 Adjustable Comfortable 3 Point Belt - Extra long adjustable straps for better fit any size driver, more safety, and durable to protect a passenger. Easy to install, simple to use, adjustable, retractable, three-point fixed. Emergency Locking Function - Fully adjustable hardware with quick release cam-lock. Only in an emergency seatbelt lock, constraints passengers movement to protect the safety of passengers, safer driving. Important in Driving - Audew 3 point belts occupant restraint in a certain space, reduce passengers collision possibility of other devices in the car, protect passengers by force longer hours, dispersed instantaneous force. Please confirm the detail size in the product description or the size chart picture in the left before purchasing. We are enthusiastic about bringing you the latest fashion, the best feeling in the world. Any question please don't hesitate to contact us. Our target is to offer clothing which can best show yourself at every occasion, offer out customers with great quality of products and keep improving our customer service. 4 If you notice the zipper is a little stiff in the beginning, simply zip up and down a few times and this should solve any stiffness and become much smoother. Satisfacion guaranteen: If for any reason you're not satisfied, just contact us for a no hassle refund. Our money back guarantee means you can try this clothing at zero risk! Mybucklemate helps kids buckle up by themselves. Its award-winning patented design keeps floppy backseat buckles propped up, easy to reach and easy to "click in." It installs in seconds and is made in USA. AWARD-WINNING, PATENTED, AND MOST WIDELY-USED BUCKLE HOLDER. 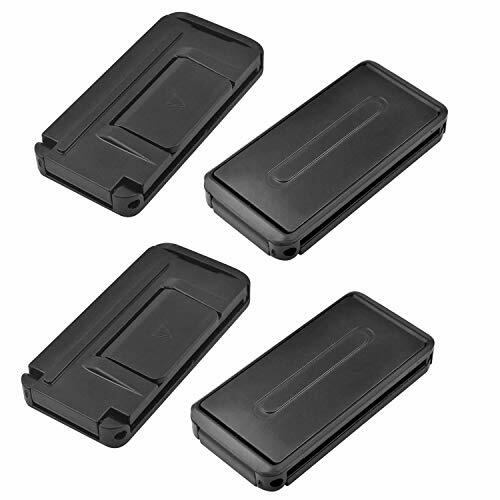 Bulky Chinese-made silicone holders are too wide to fit many adjacent buckles. USA-made MyBuckleMates are slim enough to fit adjacent buckles, stays securely locked in place, and you can fold your car seat down without removing it. MAKES BUCKLING EASY FOR ALL AGES from kids in booster seats, seniors, parents, grandparents, caregivers, and anyone who struggles with floppy buckles including special needs and adults with limited mobility and arthritis. FITS MORE CARS THAN ANY OTHER BUCKLE HOLDER and keeps floppy buckles (with 1/4 of slack between the base of the buckle and the seat) propped up and easy to click in. 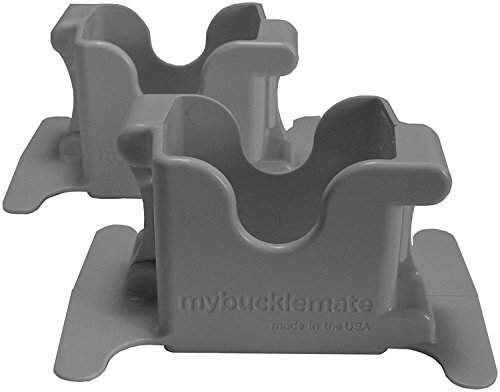 MyBuckleMate will NOT fit buckles embedded into the seat or already propped up with rigid plastic stalks (like Toyota Camry). Don't know if it will fit your car's make and model, ask us and we'll tell you. 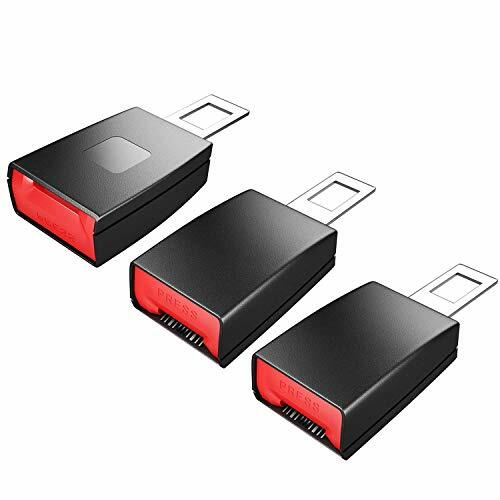 INSTALLS IN SECONDS No need to remove it to fold your car seats down and will not interfere with your vehicle's buckling mechanism. Works in most cars, minivans, SUVs and trucks with floppy buckles. MADE IN USA of the same durable ABS plastic used by the leading auto manufacturers and is BPA and phthalate-free. MyBuckleMate is the first creator of seat belt buckle holders, safety and compatibility is their priority. Pack of two (2). For ages 3 and above. Using the car seat belt adjuster , you can freely adjust the belt length, and reduce the discomfort of the belt which can make your travel easier and more enjoyable. At the same time, it can avoid the damage during emergency braking. Humanized design - there is a buckle design on the back of the product to control and fasten the tightness of the seat belt freely. Use effect - it allows you to avoid neck restraint due to seat belts while driving .You can freely control the seat belt's length to make you comfortable. Easy to use - This product does not require welding, melting or glue, so no tools are required. Our new seat belt adjuster could prevent you and your family neck injury during the driving or braking,safe and take good experience in driving,also our new model width is adjustable,very convenient to use. As everyone knows, car seat belts sometimes can be too tight on our shoulders, neck and face that make us feel uncomfortable, this seat belt adjusters keep our seat belt solved all the problems our have. This car seat belt adjuster is the most affordable and ideal car accessory. 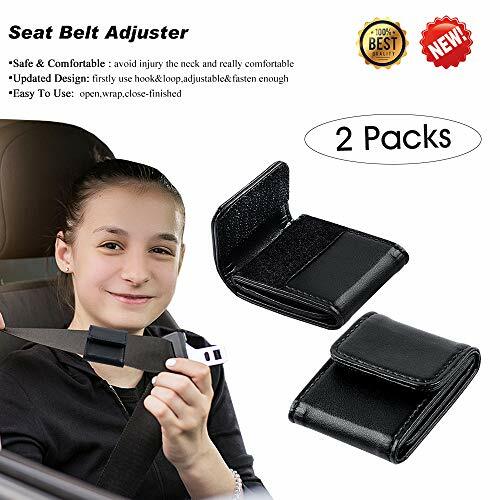 This is a nice seat belt adjuster for kids, made of high-quality leather, soft and durable, and the seat belt adjusters will normal usage once correctly secured in place. And the leather car seat belt adjuster more comfortable than plastic adjuster. This seat belt adjusters is easy, simple, non-obtrusive, glides easily, and the car belt adjuster is fasten onto seat belt easily. And this seat belt adjusters is a great idea especially for kids in encouraging them to wear seat belts, really a great seat belt adjuster for kids. And this seat belt adjusters also a good idea gift, very practical and personalized. Let have the seat belt adjuster for kids and enjoy it. This car belt adjuster will not let you down. If you have any suggestions of how we can improve this seat belt adjusters, please send email. We'll value your opinions and improve our car belt adjuster so as to please your needs. Your satisfaction is guaranteed! 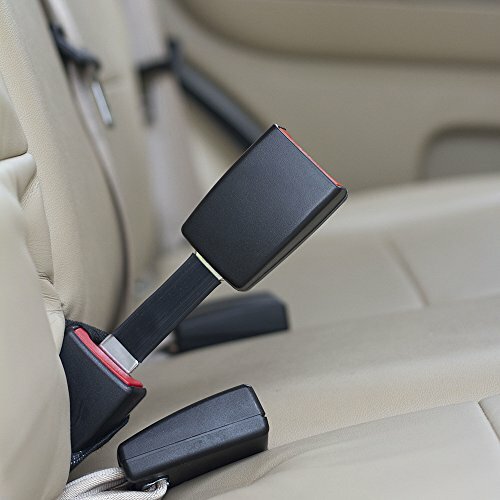 SAFE & COMFORTABLE: using this car seat belt adjuster, you can keep your seat belt away from your face, neck and chest, and this seat belt adjusters could reduce the friction between the seat belt and your body. The car belt adjuster is also a great idea to encourage the kids to wear seat belts, and the car seat belt adjuster make them more comfortable to wearing seat belts. A really comfortable seat belt adjuster for kids And adult. EFFECT& ENJOYABLE: when use this seat belt adjuster for kids, you'll not worry about the car seat belt adjuster hurt their stomach like plastic/metal car belt adjuster. this leather seat belt adjusters is more comfortable than plastic adjust and the leather car belt adjuster is also much stronger than plastic car seat belt adjuster,you can avoid injury to the neck during emergency braking. Our car belt adjuster takes you a comfortable driving experience. Car seat belts can sometimes be too tight at the shoulders, neck and face. The Seat Belt Tension Adjuster easily clips onto the shoulder belt to provide additional slack for driving comfort. Once buckled in, pull the shoulder strap out to provide the desired amount of slack, then slide the clip onto the belt and up to the top. Then simply slide the red tab to the locking position to secure the seat belt clip in place. 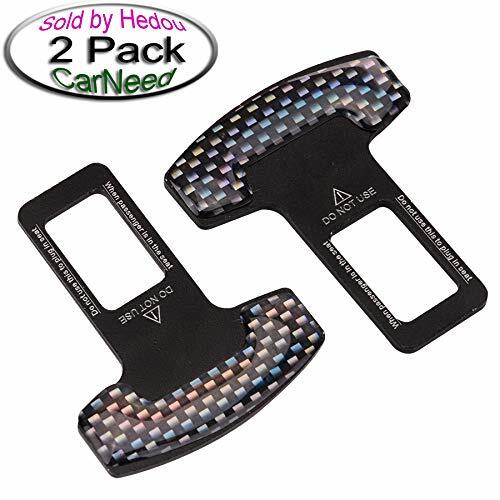 Designed to accommodate all standard seat belt widths, the two Adjusters in this pack are great for use in your vehicle, rental car, charter bus and more! The compact size makes them portable, so have one on hand wherever you go! Made from sturdy plastic, the Adjuster will last through regular and normal usage once correctly secured in place. The design of these seat belt adjuster clips ensures comfortable handling and unparalleled convenience. These make great gifts and you can have extras in every car. Keep them in your bag, purse or backpack. RELIEVE SEAT BELT IRRITATION - Car seat belts can sometimes be too tight at the shoulders, neck and face. The Seat Belt Tension Adjuster easily clips onto the shoulder belt to provide additional slack for driving comfort. 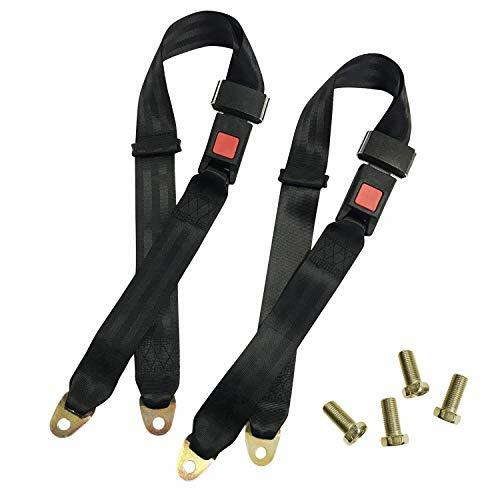 FAST & EASY INSTALLATION - Once buckled in, pull the shoulder strap out to provide the desired amount of slack, then slide the Adjuster onto the belt and up to the top. Then simply slide the red tab to the locking position to secure the Adjuster in place. UNIVERSAL FIT 4-PACK - Designed to accommodate all standard seat belt widths, the four Adjusters in this pack are great for use in your vehicle, rental car, charter bus and more! The compact size makes them portable, so have one on hand wherever you go! QUALITY MATERIALS & SMART DESIGN - Made from sturdy plastic, the Adjuster will last through regular and normal usage once correctly secured in place. The design of these seat belt adjuster clips ensures comfortable handling and unparalleled convenience. Brand: Seat Belt Tension Adjuster | Manufacturer: HY Auto Parts Co., Ltd. Car seat belts sometimes can be too tight at the shoulders, neck and face that make you feel uncomfortable. ANDUL seat belt adjuster can help you solve all these problems. 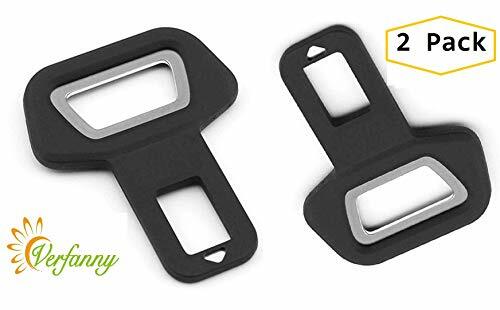 The design of these seat belt adjuster clips ensures comfortable handling and unparalleled convenience, not irritating your neck, face or chest area. Made of premium PU leather,Easy to clean, Soft and comfortable but not easily damaged. The compact size makes them portable,keep them in your bag, purse or backpack,so have one on hand wherever you go. Designed to accommodate all standard seat belt widths, the two Our seatbelt adjuster are great for use in your vehicle, rental car, charter bus and more. The shim of this seatbelt adjuster used a high temperature resistant material and does not deform within 100 . More detailed size data is represented on the picture. Small but Useful: No matter which model you use, you will encounter the problem that the seat belt will rub your neck/belly and make you feel uncomfortable. Our seat belt adjuster is a simple and effective way to protect your lower back / neck from injury, for a comfortable drive! 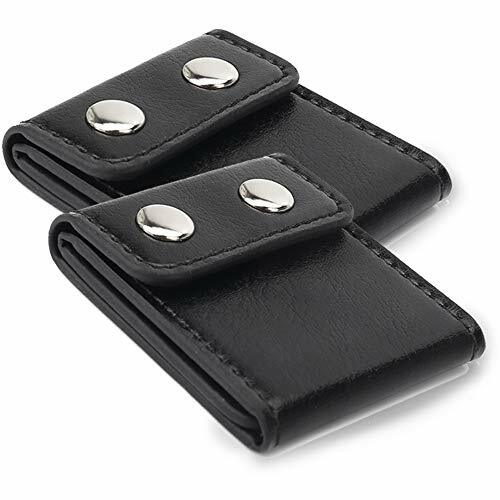 Soft and Comfortable: Made of high quality PU leather, soft, durable and hard to damage. Designed to accommodate all standard seat belt widths (fits up to 50mm). Easy to Install and Store: Our seat belt locking clip are easy to put on and slip up and down the straps for easy adjustment. You can also keep the positioner clip fastening on the vehicle seat belt. Saving time, space, and effort. Advantages: The small size fits perfectly with the seat belts, will not make you feel hot in summer. Simple operation, easy to store. You can leave them on the belt permanently. What You Get: 2 pcs of seatbelt adjuster, 12-month worry-free warranty. If you are not satisfied or any problem with the seatbelt adjuster, just send us an email and we will give you a satisfactory answer. Simple Install! Only Takes A Few Minutes! 1. Seat Belt Extender requires no installation, just Click-and-Go. 2.The seat belt extender is Made of high quality stainless steel and plastic. Strictly sewn, with high quality, high expandabilit to make you feel comfortable and safe. The 14 inch extra long extension buckle allows you to breathe easily. 3.The metal tongue design makes it easy to install and remove the seat belt extender to ensure safety in emergency situations. 4.Widely Using:The seat belt extension fits for people who can't buckle with their safety belt. Ideal for adult, pregnant women, fire fighters and service men with bulky equipment belts.Safe to use on Baby and Infant seats, good protection. Package includes: 2x Universal 14" Safety Extender Belt Extension. Ultra Durability Material: Made of polyester fabric, this durable extender is not easy to break , stainless steel metal tongue, security, strong and difficult to fall off, meticulous sewing, better flexibility, the rigid belt with high performance of supper tensile strength. Comfortable & Safe Driving: Seat belt extender increases the size and improves comfort for you. 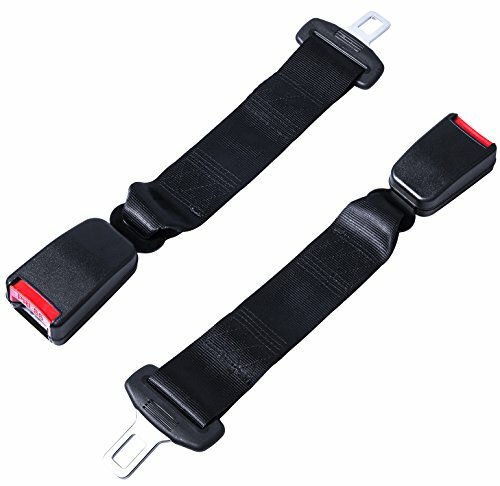 This seat belt extension is designed to connect to your existing seatbelt and increases the size and improves comfort of your existing seat, it's ideal for use for fat people, pregnant women, fire fighters. Suitbale For Most Vehicles: Our seat belt extender is designed to provide safety when original vehicle seat belt is not long enough, suitable for most vehicles. Easy TO Use: This seat belt extension requires no installation, simply click in the seat belt extender to add about 14 inches to the existing seat belt system, very simple to use. 100% Satisfaction Guarantee: A one-year warranty, If you have any problems, please contact us, we will provide solutions for you. 1. Volkswagen Golf Series, Sagitar, Passat, MAGOTAN, Ford Focus Series, MG full range, Volvo full range, Toyota's record. 2. Old Camry, G18 Lu Zun, Koleos proud, Sidi 06 CRV, Nissan Tiida Li Wei. 3. Citroen World hi, Subaru forest people, running K2 K5, Rena, move, Shengda. 4. compass, Wrangler, 270, Mazda 5, Mazda Cheng, Alto, Maple, Xiali A , And RS, Andra, Chevrolet Epica. 5. Copaci, Changan van, Geely vision, King Kong, Lincoln horse, Q5. Material Made of high-grade material-- that can be repeatedly inserted, and will not fade or stand still when used. Compatible Suitable for most Cars, Trucks and SUVs. Multiple Uses Can also be used as a bottle opener. Easy To Use Easy to install, just inserted to use. 100% Quality Assurance We hope that our products will satisfy you. If there are any quality problems, please contact customer service immediately. The Rigid Car Seat Belt Extender raises your seat belt buckle from the receptacle, giving easy access to buckling in so you can be safe with the length you need. Provides a confident driving or riding experience - no worries about getting tickets for being unbuckled. Please choose the shortest additional length necessary to buckle up. Extender lengths represent the approximate amount of additional length when the extender is buckled in. As the #1 seller of extenders in the world, Seat Belt Extender Pros is the brand you can trust. With an uncompromising focus on quality, industry-leading expertise, the widest selection and a complete devotion to customer satisfaction, we strive to earn your trust every day. This extender is E-Mark Safety Certified, but many extenders in online marketplaces are not. 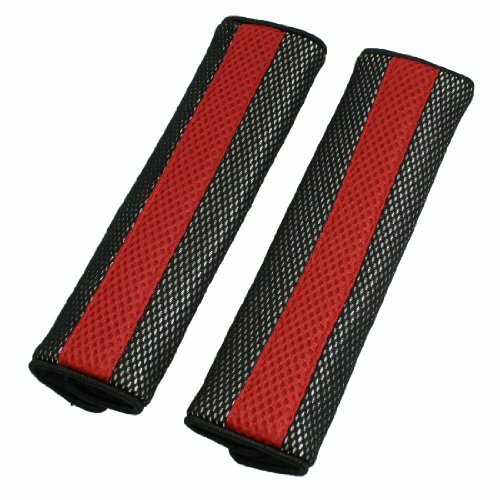 Compare the quality to know that Seat Belt Extender Pros is the best choice. Different seats in a vehicle may have different seat belts, and seat belts in the same car model may vary by year and country. 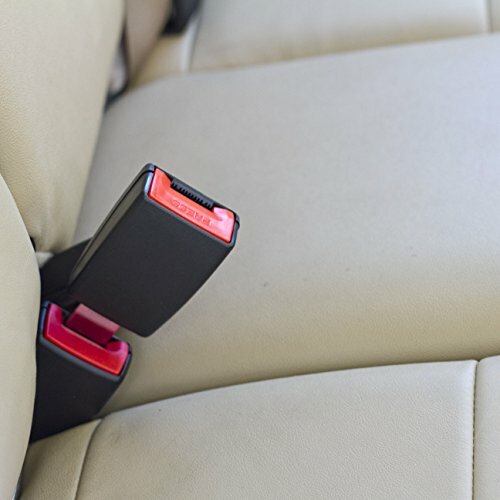 An extender is never guaranteed to securely latch, click, fit or work in any seat belt, regardless of how the extender was purchased or obtained. Read and abide by all disclaimers and warnings that come with the product. CLICK AND GO - Seat Belt Extender Pros extenders require no installation: just click and go! Tools are not required, just your hands to insert the metal part into the buckle. Simply put the metal tongue into the plastic receptacle to test whether you've found the safe fit for your car seat belt. Whether you're driving to the grocery store or taking a long car trip across the country, bucking up can save your life while driving or riding in cars. #1 GLOBAL MARKET LEADER Seat Belt Extender Pros is the industry leader in premium, safety certified extensions. This extender was manufactured in an ISO-certified, DOT-registered factory. Quality matters when it comes to your safety so we encourage you to fulfill your seat belt extension needs only through the highest quality products. Don't settle for cheap materials and lack of standards when it comes to auto parts. Seat Belt Extender Pros offers not just top quality, but the widest variety. SAFETY TESTED AND CERTIFIED - Seat Belt Extender Pros extenders are E4 Certified, a European safety standard recognized around the world, and labeled accordingly. When you receive your extender, you will be able to see the safety markings on your belt extension. Universal seat belt extenders do not exist - extensions that will fit every car seat belt do not exist. Each seat belt is unique based on the car's model and year and where it is found in the car. BEAUTIFUL DIVERSITY - Your car's seat belts are unique with many traits. Extenders are also not universal and have features that differentiate them from others. METAL TONGUE DIMENSIONS of this item - tongue width: 21.5mm, hole width: 11.5mm, hole length: 20mm, measurement of metal bar between top of hole and tip of metal tongue: 6mm. Do not purchase this item, unless your seat belt metal tongue's dimensions (where you need the extender) match all these measurements. 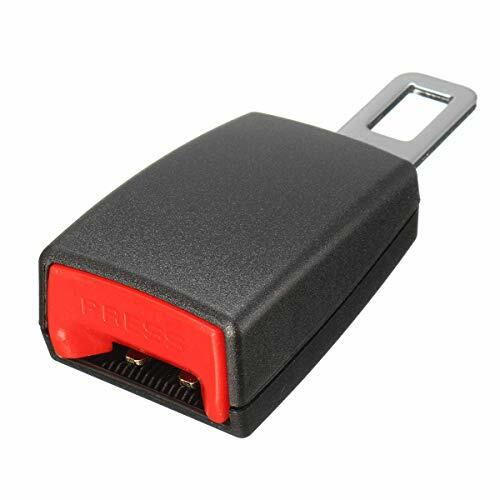 Brand: Seat Belt Extender Pros | Manufacturer: HR Auto Parts Co., Ltd. The Bestwin extender is suitable for those who cannot use heavy equipment buckle belts in other ways, increase the size of existing seat belts and increase comfort. lease refer to the dimensions and instructions clearly before purchasing because the product may not be compatible with your car. Easy To Use:This car seat belt extension requires no installation,Simply click in the seat belt extender, it's very simple to use. Comfortable:Extend the seat belt buckle to make it easier for your child to find the buckle and insert it when installing the car seat belt. Help them build confidence, they can do their own seatbelt. 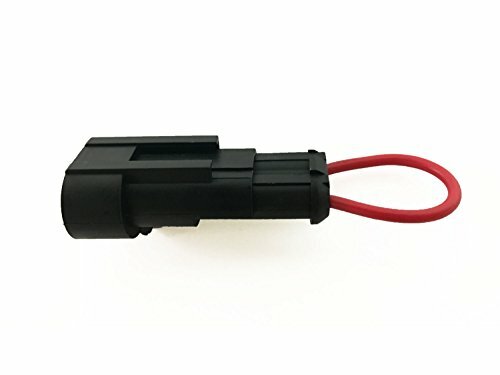 Note:This product can be used in the original 0.82 inch-0.86 inchlatch width model, most cars are of this size; the original latch width of a few models is 0.96 inch-1 inch. After-Sales Service:We guarantee to provide the best quality products and best service, if any problems, you can contact us, we will provide a variety of solutions for you to choose.